We were at our weekly Bible study this past Wednesday studying the passage in Matthew 16 that is often referred to as “Peter’s confession.” We were all over the place in our discussion, but then Brandon Green shared some perspectives that brought a hush over the group. They were profound thoughts, and I asked him if he would do a guest blog on here to share some of them. Brandon has been around River City since the beginning, and is a brilliant theologian. He’s a newbie to Twitter, so you could show him some love as he gets his profile off the ground. He also blogs here, and that’s worth subscribing to as well. I hope these thoughts challenge you as much as they did each of us! There is a point when a significant phrase or quote is commandeered and is used so frequently until you can hardly remember the context in which the phrase was originally coined. This happens a lot with the bible especially with the words of Jesus. Jesus is by far the most quotable individual in human history. Phrases like- “…the truth shall set you free”, “ you live by the sword, you die by the sword” , “do unto others as you would have done to you” , “ judge ye not, least ye shall be judged…”, “ Greater love has no one than to lay down one’s life for one’s friends”, “ turn the other cheek.” Etc. In Matthew 16:24 we find a very similar quote or phrase, like the others; these words of Jesus can stand alone without context and still have power, they may even inspire some to behavior modification. However the context in which this phrase was born is essential to understanding the gravity of what Jesus is saying here. Chapter 16 begins with the Pharisees asking Jesus to give a sign from heaven to affirm who he is; Jesus denies this request and exits unceremoniously; saying that they are wicked and perverse generation. As he and his disciples set to cross the lake, presumably by boat; he warns his students about the yeast of the Pharisees and Sadducees. To truly grasp the weight of this warning we have to keep in mind that prior to becoming Jesus disciples; the social-political, spiritual, and theological formation of the 12 had been grounded in this community of the Pharisees and Sadducees. So the disciples were already under the tutelage of the teachers of the law. You can imagine the tension the disciples were in. This reality gives us a backdrop to this private conversation they were about to have with Jesus. Initially Jesus asks who do people say that I am? Then he asks who do you say that I am? Given the backdrop; Peter’s bold declaration that Jesus is the son of God; the messiah that was to come was a significant jump. That is why Jesus says emphatically; “Blessed are you, Simon son of Jonah, for this was not revealed to you by flesh and blood, but by my Father in heaven” it is truly miraculous given the bogus teaching the twelve were subjected too. One would think that the teachers of the law would have sway on the thinking of the disciples given their history and prominence in society. Yet Jesus; this obscure teacher has captured the imagination of the twelve, causing them to unlearn many of the things they held deeply as facts. We miss the miracle most of the time when read this text, we miss the distance Peter had to journey to get to this place. According to Jesus reaching this decision was not humanly possible. It literally took the help of God. Now that it is clear that the yeast of the Pharisees and Sadducees had not completely corrupted the minds and hearts of his disciples, Jesus starts to reveal the thesis of his mission. He reveals that he must die. Peter would have none of it; he went so far as to rebuke the master. Jesus who has just affirmed Peter as the bedrock of his kingdom, declaring him as a herald; turns to Peter and says to him: “Get behind me, Satan! You are a stumbling block to me; you do not have in mind the concerns of God, but merely human concerns.” Ironically it is said to Peter in verse 17 that Peter understood who Jesus was because Peter held the things of God in priority versus the things of man. Here we see the opposite being said of him. This chapter is rich with all sorts of little narratives that can take you down a theological rabbit trail. However if I read verse 24 wit h the rest of the chapter serving as my backdrop, I can only read it one way. This felt to me almost like an ultimatum. This is what it looks like to follow me… Pick up your cross and follow me. It’s interesting that he used the cross in this analogy; he had no idea what mechanism he would be tortured by, but knowing Jesus we know he didn’t just arbitrarily chose the cross for his illustration. What is also interesting is that a cross is so finite. Choosing the cross is to make a choice knowing the outcome, to commit to dying a criminals death. For the most part people that are usually crucified don’t chose to be crucified, it’s not like folks wake up and say, “you know what, I think I might pick up one of the crosses today…” Even if an individual were convicted of a crime they wouldn’t have much say as to how they would be executed. This statement carries with it an underlying tone of revolt. To choose the cross is to push back against power in a way that could be seen as criminal. This chapter serves almost as a manifesto of discipleship. To follow Jesus we must be aware of the teachings that we’ve received before Jesus entered into our lives. We must not allow those teaching to convolute the mission and call of Jesus. We must make a declaration as to who he is; and in that declaration we will find out who we are, and what we are called to do. Each person’s call may vary and the iteration of our mission may not look the same. What we know for sure is that we are all called to pick up our cross and follow him. 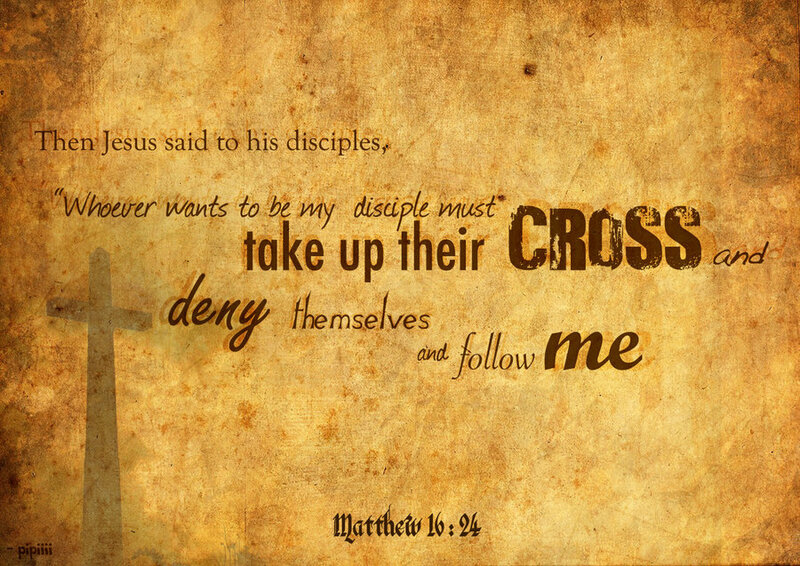 Jesus is saying to his disciples and to us there is no form of discipleship without the cross. This can feel abstract and directionless without the backdrop given us in verse 16:18. In verse 18 after Peters proclamation; Jesus responds with; “and I tell you that you are Peter, and on this rock I will build my church, and the gates of hades will not overcome it. I will give you the keys of the kingdom of heaven; whatever you bind on earth will be bound in heaven, and whatever you loose on earth will be loosed in heaven.” What’s interesting about this verse is the phrase “gates of Hades or hell”, gates have two significant purposes; one to designate ownership or land rights, the other is to keep what is in the gates in and what is out; out. We can see the gates of hell in the social construct of race, broken marriages, broken education systems, self hate, gender bias, corrupt justice system, human trafficking, disease, hunger etc. These are the areas the enemy seeks to claim and keep; anything that would seek to maintain or increase the chasm between God and humanity and amongst ourselves. The enemy would love to maintain the status quo, to quash any attempt at introducing an alternative reality. What Jesus communicates with this illustration is that what accompanies identifying who he is; is to be engrafted in him and his mission. His mission was always the cross. If I’m honest I would have to confess that the gospel I’ve come to understand is one that moves me as far away from the cross and the gates of hell as possible. I believe that was the gospel Peter was hoping for; that’s why he couldn’t understand Jesus having to die. The cross will keep you in close proximity to danger; the cross will always bring us to the many gates of hell. This is the destination of discipleship; this is what it means to be his follower. There’s so much I love about this post but to refer to the teaching that the disciples had received from the Pharisees and Saducees as bogus and as corrupting the disciples is problematic. These teachers also were seekers of the divine,were engaged in an authentic struggle for holiness, and though depicted in the gospels at times as Jesus’s nemesis were more like a competing school of thought. As we reflect on these stories it is important to speak of our Jewish brothers and sisters (even these ancient ones) with the respect due fellow seekers and children of our common feather Abraham.